Life is full of surprises. Some are good, some leave you in tears. There are some surprises upon which you reflect that it’s pretty much what you expected and then there are surprises that leave you going #WTF. Until a month or so ago I’d never even heard of Brother Firetribe and they would almost certainly have passed me by until Planet Rock put the insanely catchy inedible sorry ‘Indelible Heroes’ on their playlist. A chance posting on Facebook about their three date tour (can three dates be considered a tour?) in mid-March persuaded me to buy a ticket and hence I’m walking up the stairs to a venue at the Actress & Bishop that I didn’t even know existed. Bearing in mind my minimal knowledge I fully expected to be in a crowd of a dozen but by the time the band walk on stage at 8.30 we’re at my #WTF moment. The place is nearly full. 70% of the crowd is under 50. 50% is under 40 and it’s a 50/50 m/f split, and as the gig progresses it’s abundantly clear that I’m about the only one who’s not singing all the words to all the songs! The band walk on and kick off with ‘Help Is On The way’ from ‘Sunbound’ the most recent album and then for my second surprise of the night as it’s followed up with ‘Indelible Heroes’, and I think that it’s fair to say that singer Pekka Heino is surprised as I am by the response and sheer volume from the crowd singing along in front of him. No doubt it helps that the song namechecks Bowie, Motorhead and Prince but I doubt that there’s a person in the room who isn’t hooked. Pekka has a wry line of wit and explains that this three date “tour” of London, Birmingham & Manchester is in fact a week’s holiday for the band and they thought that they’d use it to come to England. He has several attempts at pronouncing Brummie with the help of the front row and doesn’t quite nail it, but quite frankly who cares! The band are all smiles and pick songs from across the four albums; ‘Heart Of The Matter’ ‘For Better Or For Worse’ ‘Shock’ and ‘Wildest Dreams’ stand out and drive the set forward. There’s something about Scandinavian songwriters (from Abba through Europe and Max Martin who wrote for Britney Spears et al) that as English is their second, third or even fourth language they keep lyrics simple and are big on hooks and melodies. Brother Firetribe are no different. Look around the crowd and there’s hands pumping the air, mass clapping (mostly in time) and choruses that everyone can sing along to. And smiles. As we head towards the end of the hourish set, Pekka points out that whilst they love playing for us, it’s a dangerous job being a front man as he’s now punched the ceiling above him several times. The main set finishes with ‘Heart Full Of Fire’ and whilst the rest of the band walk off Pekka tells us that he doesn’t want to go before they all walk back on and finish with ‘I Am Rock’. 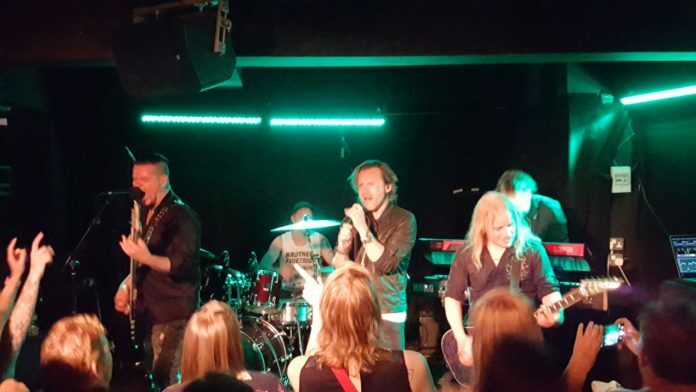 Let’s give credit to the rest of the band as the lush keyboards give Brother Firetribe a big part of their sound and whilst Erno Vuorinen on guitar might be small in stature, he plays an equal part at the front of the stage with some licks that pull the songs together. It’s a shame that they’re only here for these three dates, hopefully they’ll come back again for a longer holiday. If they do, then do yourself a favour and go to see them. You won’t regret it.